Beta Theta Pi is currently renting Delta Upsilon’s house at 2307 Sheridan Road. Northwestern’s DU chapter is returning to campus next year. The Northwestern chapter of Delta Upsilon fraternity is officially returning to campus and will be eligible to participate in recruitment next year. This month, DU’s international headquarters approved the chapter’s return from its suspension, said Eric Horner (Weinberg ‘97), NU’s director of online engagement and a member of the chapter’s alumni board. The fraternity is expected to form an advisory board by December before winter recruitment, Cynthia Rose, NU’s director of fraternity and sorority life, said in an email to The Daily. Rose said the chapter will be able to recruit new members after the formal recruitment period ends in January 2016. Rose said from Sept. 21 to Dec. 12, the organization may also market its reestablished chapter on campus. DU has the lease for its on-campus house, 2307 Sheridan Road, which is being rented by Beta Theta Pi fraternity. 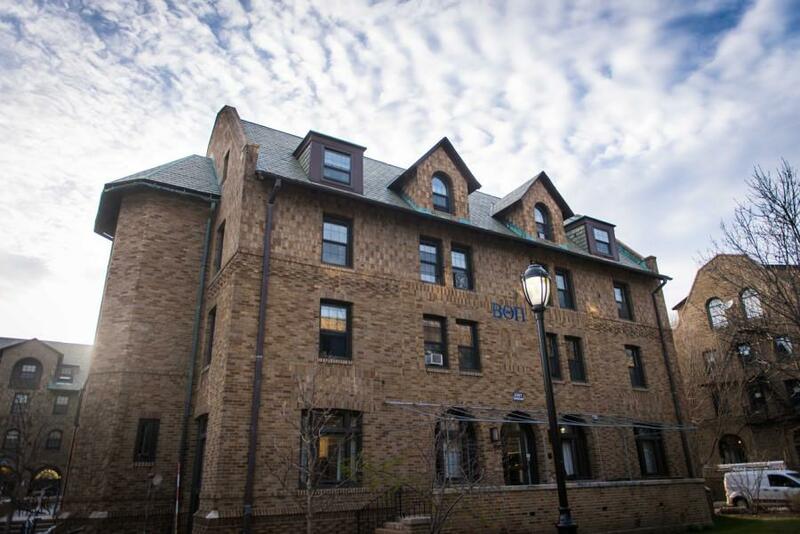 Beta plans to move out after this academic year, as construction on its old house is slated to finish this July, said McCormick sophomore Daniel Perlovsky, the NU Beta chapter’s president. DU was found to have violated the University’s alcohol policy in May 2012. An investigation that followed found that the chapter had provided alcohol to minors, allowed minors to consume alcohol and broke the substance-free housing sanction. After failing to follow protocol to avoid suspension, the fraternity was suspended for one year in April 2013. Rose said they were eligible to return to campus for the 2014-2015 school year. Fewer than 10 members who were affiliated at the time of the suspension are still NU students, Horner said. NU’s Fraternity and Sorority Life Advisory Board, which has been in close contact with DU since the end of 2014, reviewed a presentation by NU’s chapter in February requesting to return to the University, Rose said. The chapter introduced items including an advisory board plan, a new chapter manual and a recruitment outline. Rose said NU and DU’s international headquarters worked together to reestablish the fraternity. The NU advisory board, comprising students and faculty, reviewed the fraternity’s future accountability, internal structural developments and potential contributions to the community. The Interfraternity Council and the Panhellenic Association were also involved in the recommendation to approve DU’s return to campus, said IFC President Mark Nelson, a Weinberg junior. The DU alumni board has maintained relationships with the more than 2,000 DU alums from NU and hosted two reunion events at Homecoming during the suspension period. “My affiliation with DU helped me to develop as an individual, learn leadership skills and to live on campus independently,” Horner said.